Yeast donuts are fried bakery products that are yeast-leavened, unlike traditional donuts that are chemically-leavened with baking powder and made with a cake batter. The unique characteristics of donuts are their traditional ring shape and the method of frying in hot oil. Yeast-leavened donuts are porous, resilient and have a bread-like crumb structure. How are yeast donuts made? In general, the formula for yeast-raised donuts are the same as lean sweet doughs or hamburger bun doughs. Both the straight dough and sponge and dough (S&D) system can be used for the production of yeast donuts. * Patent bread flour from hard wheat classes (protein content of 11.0–13.0%). A blend of 80% hard wheat flour and 20% soft wheat flour can also be used to modify the texture of the finished product. Dough mixing (to full development). Mixing time will be a function of flour strength, mixer speed, batch size, and delayed sugar/fat/salt addition (for proper gluten development). Final dough temperature should be between 78–82°F (26–28°C). Bulk fermentation. Dough ferments for 1–3 hours at ambient conditions until it doubles in size. Fermentation time is controlled by dough temperature, water absorption, pH, osmotic pressure, yeast food (fermentable sugars) and yeast level. Makeup. Dividing of bulk dough into dough blocks (pre-shaping). Blocks are then sheeted and cut into an appropriate shapes (e.g. round or hexagonal) or by extruding with a low-pressure extruder. Final proofing. Dough pieces are proofed at 90–110˚F (35–43˚C); 40–70% RH for 30–40 min. Indentation test can be done to check final point. Frying by partial immersion in oil at a temperature of 375–385°F (190–196°C).vDough floats on top of heating oil due to its porous structure and low density, caused by air incorporation during mixing, yeast fermentation, gas expansion and water vapor production during frying. Glazing (optionally applied to product when still hot). Cooling to internal temperature of 95–105°F (35-40°C) before packaging. As with cake doughnuts, yeast-raised donuts are allowed to cool before icings are applied. Icing (optional, applied to cooled product). Dusting/coating with pulverized dextrose (optional). Due to its low solubility, the doughnut displays a different flavor profile. Dextrose is also less sweet than sucrose and its crystalline structure creates a cooling sensation when it melt in the mouth. Sweeteners (especially in dry form such as sucrose) can delay gelatinization of wheat starch, and as a consequence, the temperature at which the “foamy” dough converts to sponge (crumb set) increases. This has processing implications during drying. 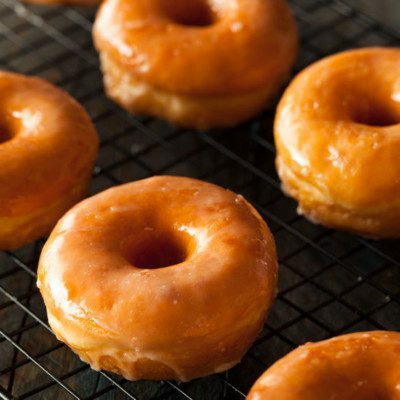 In some yeast donut formulations, the starch gelatinization temperature can be raised significantly and adjustments in frying time may need to be considered to achieve proper crumb in the center of the product (coldest point), otherwise the product may look raw inside. Given the relatively high sugar content in a yeast doughnut formula, significant osmotic pressure builds up within the dough. The high osmotic pressure may not be tolerated by standard baker’s yeast strains and fermentation rate may be greatly affected. Use of dry yeast forms that can withstand high osmotic conditions (osmotolerant) is recommended in case proofing times become excessively long to obtain a proper volume. Use doughs of lower water absorption. Use stronger flours (higher protein content). Decrease levels of enriching and tenderizing ingredients such as sugar and fat. Doughs that are too rich will brown too fast and absorb too much frying fat. Increase levels of structure-building ingredients, like ones rich in protein (e.g. soy flour, wheat flour, eggs, vital wheat gluten, nonfat dry milk). Gisslen, W. “Doughnuts, Fritters, Pancakes, and Waffles.” Professional Baking, 7th edition, John Wiley & Sons, Inc., 2017, pp. 229–232. Cauvain, S.P. “Bread and Other Fermented Products.” Baking Problems Solved, 2nd edition, Woodhead Publishing, Elsevier Ltd., 2017, p. 212.